On Saturday & Sunday we spent time in the city that shares my name, Milan! It’s home of the Milano Duomo its cathedral, (or the Sagrada Familia II as we called it because it reminded us of it). Also a fashion rival with Paris, our experience in Milan can be represented by our photo collection below. Milan, our last stop before going back to Emmendingen, is also home of the original of “the last supper” by Leonardo Da Vinci (maybe appropriate as later the second day we had our last supper in the van! ).The famous inventor and painter was also featured in the MUST (Museo Nazionale della Scienza e della Technologia) museum that we went to on Sunday after going to a fascinating cemetery which on each grave stone was a sculpture. Milan was a short but fascinating experience for us, extremely different to Venice, and sadly the only other place in Italy we’ve been to on the trip. The city that shares my name, a great start to the slowly but surely coming end of our European trip. 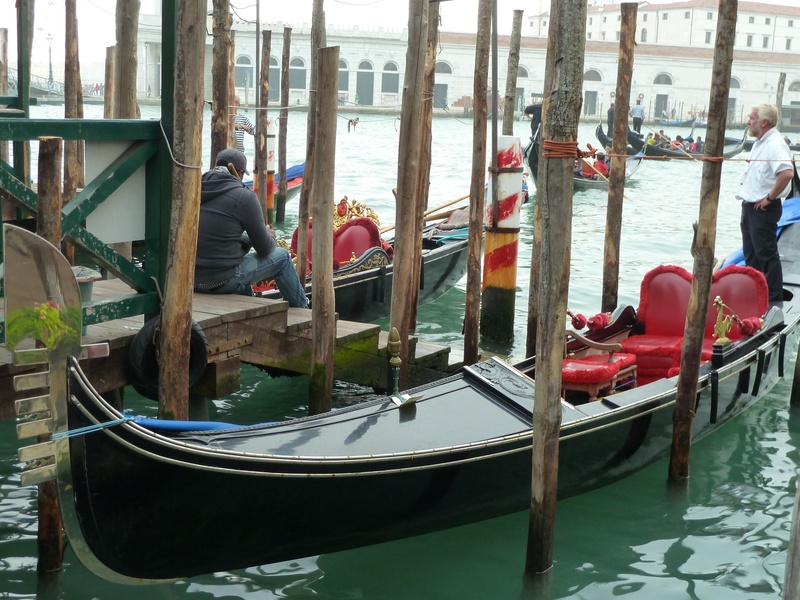 On Friday we decided to spend another day in Venice. First we went to a cafe and did some reading to learn a bit more about the city and decide what we’d like to do. There was an interesting looking glass shop opposite the cafe so went in to have a look inside. We saw a man making a glass ring on his desk with a gas flame and some glass sticks which he melted into shape. We had decided that we wanted to go on a walking tour so we got tickets, a had a bit of pizza for lunch at a restaurant, then headed towards St. Mark’s Square where the tour started. 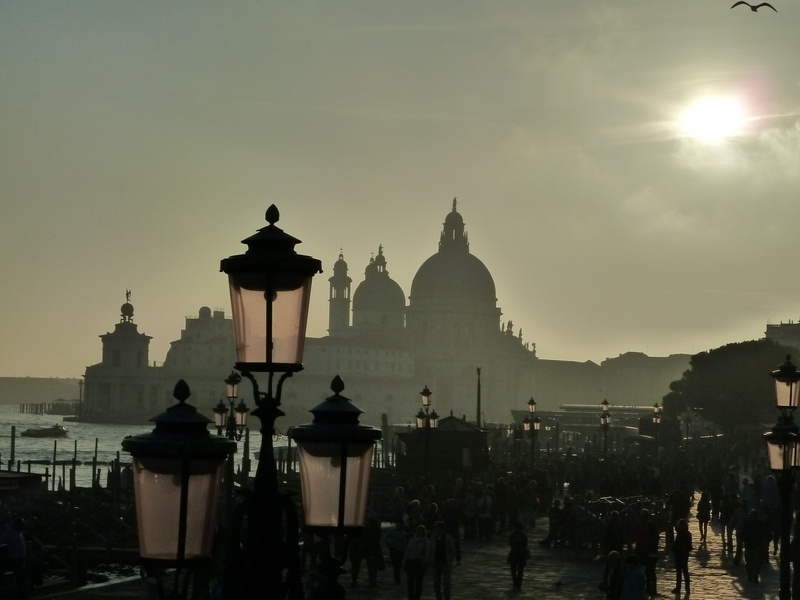 The tour was called “Discover Venice”. The guide took us around the town and told us about gondolas and how the boat was built to lean to one side and the gondolier stood on the other side to keep it balanced and rowedThen we went on and the guide told us why most of the houses had its main entrance going into a canal, because they needed to ship stuff into their houses from the canals. As we walked, we saw a roof with smoke coming out of it and we guessed it was a fire but we weren’t sure. The guide also told us that because Venice was a lagoon, and therefore unstable, every single building was leaning (the leaning tower of Pisa was a joke to them!) The buildings are built on wooden piles and need to be flexible so they are made of bricks. When we came to the end of the walk we had a look around St. Mark’s Square then we wanted to start walking back to the bus stop and find dinner on the way but we ended up walking in a circle back to St. Mark’s Square because we couldn’t find where we were on the map. Then we tried again and finally managed to get back to the bus just in time! After our night in the motorway stop, we headed, after an hour or two of driving, through Slovenia to Italy. On the way our van clocked 100,000 miles( altogether not just this journey). Once in Italy we arrived in a campsite not far from Venice where we planned to spend two nights. Although it was late(ish), we took the bus from the stop just outside the campsite into Venice for our first taste of Italy on this trip. 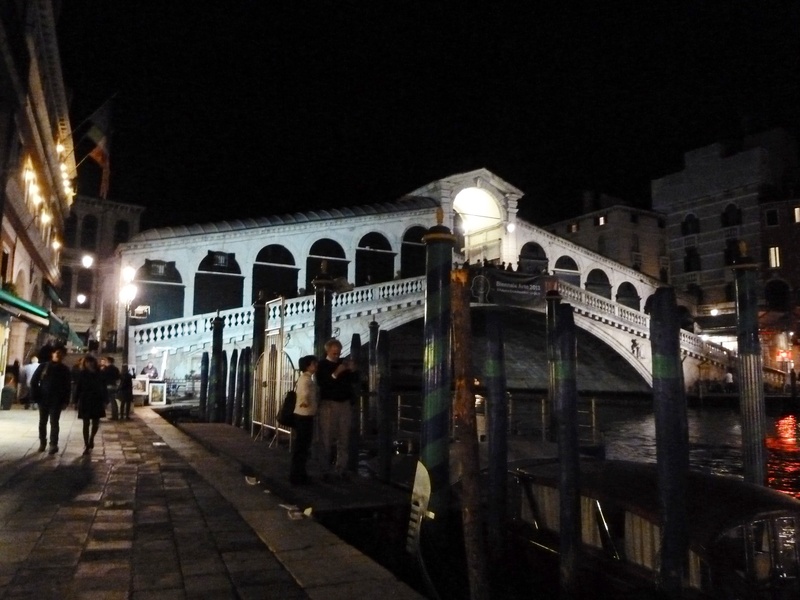 Once arriving in the lagoon we chose a route taking us towards the Rialto Bridge, Venice’s most famous bridge where nearby, we had dinner. Nilay And I chose a delicious 4 cheese pizza to share while Mama and Papa had various pasta dishes (finally, eating Italian in Italy!) The way back to the bus stop was a race. Unless we caught the 9:28pm bus back to the campsite we’d have to wait another 40 or so minutes till the next bus. Luckily we made it, although Nilay tripped on the stairs of one of the bridges near the bus stop (fortunately he was OK). After a long day of driving and walking we finally got a good nights sleep, Papa tried sleeping up top for once swapping places with me. October 23rd was our last day in Dubrovnik. In the previous days we had looked at the old town from different angles – from the sea by kayaking around the old town, above from Mount Srd, and within by walking around the streets of the old town with a local guide as well as on our own. We had not yet seen the town by walking on the famous wall which surrounds the old town. This wall walk is such an attraction, that one has to pay to access the wall walk. As my guide book was praising this wall walk as one of Dubrovnik’s most important attractions, the boys and I decided that we really wanted to do this walk before we departed from Dubrovnik. We were not disappointed, the 2 km walk on the town wall was fantastic. 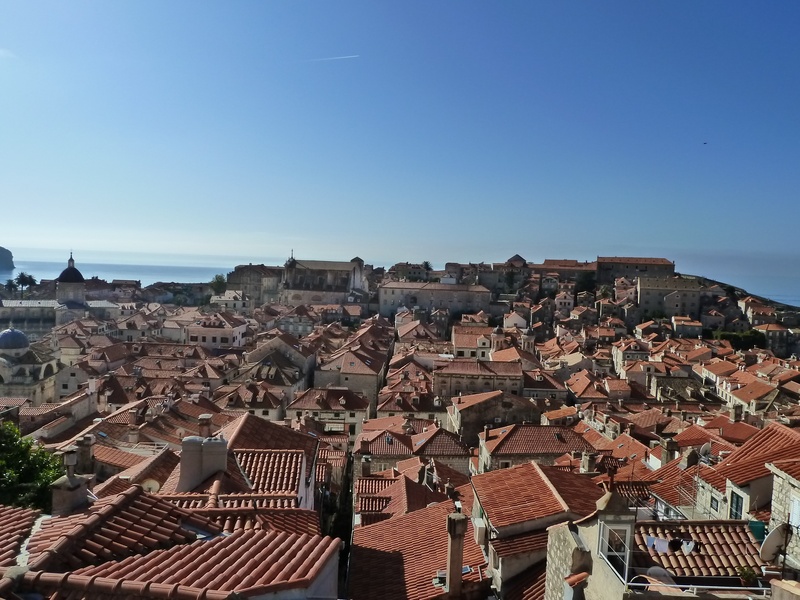 The views on one side onto the roofs of the old town which have nearly all been repaired since the destructions suffered in the 1991 /1992 attacks, and the endless blue of the Adriatic Sea on the other side were just beautiful. As it was a very hot day, we were longing for a dip in the cool sea when we got back to our apartment just before lunchtime. So we walked to the nearby beach to enjoy a quick refreshing swim (probably our last swim in the mediterranean sea for a while). We then had to think about packing up the van and start our journey back north. We spent the afternoon and evening driving with a stop for dinner in a really nice restaurant near Krka National Park. We decided to spend the night in the campervan on a motorway stop in northern Croatia. Yesterday, while we were walking around Dubrovnik we noticed the amount of cats, many more than we were used to. The Republic of Ragusa and the ‘Restaurantisation’ of Dubrovnik. Yesterday morning we ventured within the famous walls and under the expert guidance of Marko, local resident and walking tour guide, we learnt about some of the history and architecture of the Old Town. Dubrovnik was formerly part of its own free state, the Rebublic of Ragusa, between its independence from the Venetians in the 14th century and being conquered by Napoleon’s Empire in 1808. Under the protection of the Ottoman Empire during this period, the city flourished as a major maritime trading hub in the Mediterranean and became noted for its wealth and skilled diplomacy. It’s population hit it’s peak in the 16th century at about 60,000 and most of its current architecture is reflected by various Italian influences. The Old Town origin dates back to the 7th Century, as does its defensive walls however the current fortification around the town was mainly constructed between the 14th & 17th century and represents one of the best fortifications of the Middle Ages. Being on a major fault line it however suffered from a major earthquake in 1667 which did not affect the wall significantly but destroyed many of the buildings within. In current times it has been a major tourist destination and became a UNESCO World Heritage site in 1979. Despite this it suffered heavy shelling by the Serbian&Montenegrin Forces in 1991 during the Yugoslavian Civil war. This has been one of the reasons for the reduction in population of the Old Town, which has gone from about 5,000 to ~900. Whilst the city has been completely restored it has also, due to its tourism attraction, undergone significant “restaurantisation” with all kinds of culinary delights, bars & cafes along the narrow streets and plazas. 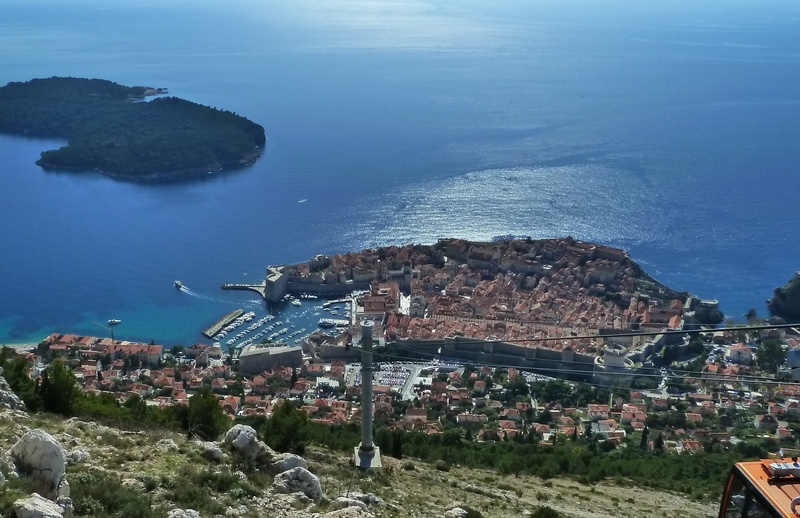 In the afternoon we took a ride in the cable car up Mt Srd for some spectacular views and a visit to the museum of civil war housed in the Srdj Imperial Fort built during the Napolean age and an strategically important location for the defence of Dubrovnik during the war in 1991. A great taster into the multifaceted history of the city and some of its ironical past!